John S. Roosma was born September 3, 1900 in Passaic. A talented and highly disciplined athlete, Johnny was one of the top prep basketball players in the country for Passaic High School. The squad he captained was known as The Wonder Team and, coached by Ernest Blood, reeled off 179 victories in a row. Johnny’s teams won 57 of those games.—including three state title in 1919, 1920 and 1921. As a senior in 1920–21, he scored an unheard-of 882 points. He also played football and baseball. Johnny continued his hoops career at West Point. He was recruited by Douglas MacArthur. The Black Knights, coached by Harry Fisher, won 73 of 84 games during five varsity seasons, including a 33-win streak, and Johnny became the first college payer to total more than 1,000 career points. He was a three-time All-East and All-American, and captained the 17–0 1922–23 team. Johnny also played for Army’s baseball, football and track teams. After graduation, Johnny served in China in the late 1920s and early 1930s, before returning to the U.S. Military Academy as provost marshal. 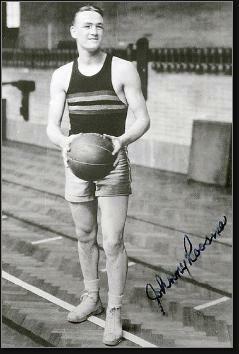 In 1934, he set a record by hitting 99 of 100 free throws during an exhibition. He would better that mark, once sinking 139 of 140. In 1941, Johnny was stationed at Pearl Harbor when the Japanese attacked on December 7th. After fighting in Europe during World War II, he finished his military career in the 1950s as the head of the army post on Governor’s Island, achieving the rank of colonel. Johnny was head of cadets at the Bordentown Military Academy before retiring in 1961. He was enshrined in the Basketball Hall of Fame that same year and West Point’s athletic MVP award was named after him. Johnny passed away in Verona at age 83 in 1983.